I WENT ON ONE OF THOSE MOVING WALKWAYS - DIDN'T CRY ONCE. HELLO – I WANTED TO WRITE TO SAY THANKS TO ALL THOSE THAT MADE MY SHOW NITWIT HAPPEN THIS YEAR. 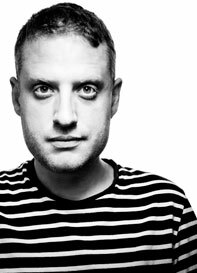 In particular the good good people of JUST FOR LAUGHS LIVE and TROIKA, the PLEASANCE THEATRE, IDIL SUKAN, CHRIS GEORGE and of course, the unflinching members the audience. If you can’t see the image – here are those reviews again – get ready to glow inside. Oooh. THE TIMES: **** So all hail the comedians you could never clone. 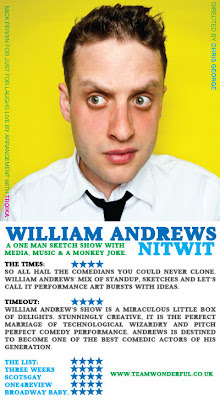 William Andrews’ mix of standup, sketches and let’s call it performance art bursts with ideas. TIMEOUT: **** William Andrew’s show is a miraculous little box of delights. Stunningly creative, it is the perfect marriage of technological wizardry and pitch perfect comedy performance. Andrews is destined to become one of the best comedic actors of his generation.